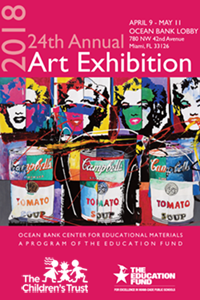 For 25 years, as a part of their commitment to the community and its children, Ocean Bank and The Education Fund have sponsored an art exhibition for the students and their teachers in Miami-Dade County Public Schools for six weeks in the lobby of Ocean Bank's headquarters at 780 N.W. 42nd Ave. in Miami. Using inspiration and imagination, students and teachers create magnificent works of art by combining nontraditional items such as model airplane propellers, fuses and other electrical parts, scrap metal, medicine bottles, bottle caps, electrical wire, ceramic shoes, and furniture, with premium quality arts and crafts materials such as fabric, art paper, scrapbooking materials, sewing machines, yarn, buttons, ribbon, and canvases, all donated by Joanne Fabrics and Pearl Art Supplies to the Ocean Bank Center for Educational Materials. Students' and teachers' artwork often include sculptures, mixed media, 3-D pieces, and a large number of paintings and drawings. "For the Love of Art" Annual Charity Auction in the spring. Click Here To Download Last Year's Program Book!